So, what are UTMB points? This race report about the Hardwolds 80 starts in the French Alps to explain what “UTMB points” are and why most of my running in 2017 and 2018 has been in pursuit of these silly points (because they were invented in France). The Ultra Trail du Mont Blanc is a 100 mile race, starting in Chamonix, France and takes around the Mont Blanc Massif via Italy and Switzerland. It is one of the greatest ultra-running races in the world, taking you across the magnificent alpine landscape with more than 10,000m (!) of climbing (Highlights from 2018: https://www.youtube.com/watch?v=l5vDz29uS0o). This race has been on my bucket list for a few years now, but always seemed a little bit crazy (too much climbing for a Dutchman and waaaay too long!). About 10 years ago the UTMB became too popular to accommodate all the runners and a lottery was introduced. To avoid inexperienced ultra-runners undertaking the race they also introduced a qualification scheme. For the 100 mile race you would have to collect at least 15 points across a maximum of 3 races. A mountainous 100 mile race would be 6 points, a hilly 30 miler maybe two. Race directors can apply (read: pay) to have UTMB points attached to their race. 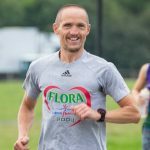 After running my first ever ultra at the start in the spring of 2017 (http://www.tynebridgeharriers.com/2017/05/13/2017-60-van-texel-race-report/) I realised that a 100 miler in the French Alps was within reach and I started looking for races with UTMB points. By July 2018 I had done 2 races with UTMB points (White Rose Ultra 60 miler and a 100 miler in Portugal) totalling 11 points, so only 4 more were needed! So when I noticed a new race being announced by the organisers of the long running Hardmoors Ultra Series which was worth 5 UTMB points, the choice was easy, Hardwolds 80 would be my final UTMB qualifier! After racing at the end of June (100 miles in the Portuguese mountains), end of July (50 miles in the Lakes) and start of September (100km flat on Dutch roads) I was happy to have a little longer break before a short block of training towards the Hardwolds 80. However, with the weather changing, less daylight, family time, busy times at work (excuses, excuses!) I felt that training could have definitely gone better. I had bought some weights for strength and condition sessions at home, but after two times they were never seen again… I also managed to cycle into a lamppost (don’t ask) leaving me out of running order for over a week. A less than ideal preparation, but on a more positive note, I did manage to convince John Hurse to help me out at the race. I did explain to him that in ultra-running language “crew” stand for “Cranky Runner, Endless Waiting”, but somehow he still said yes! He would be returning from a work trip the night before the race, so we agreed that he would drive down in the morning to meet at the second checkpoint and he would try and run the final few miles with me (more on that later). We made sure he had all the kit, food, snacks, red bull, beers (!) and other nutrients with him. 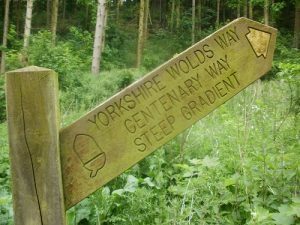 The Hardwolds 80 follows the Wolds Way, an 80 mile long distance walking path between Hessle and Filey across the wolds of Yorkshire taking in about 2,500m of climbing. The national trail website recommends 5 to 6 days to complete it. 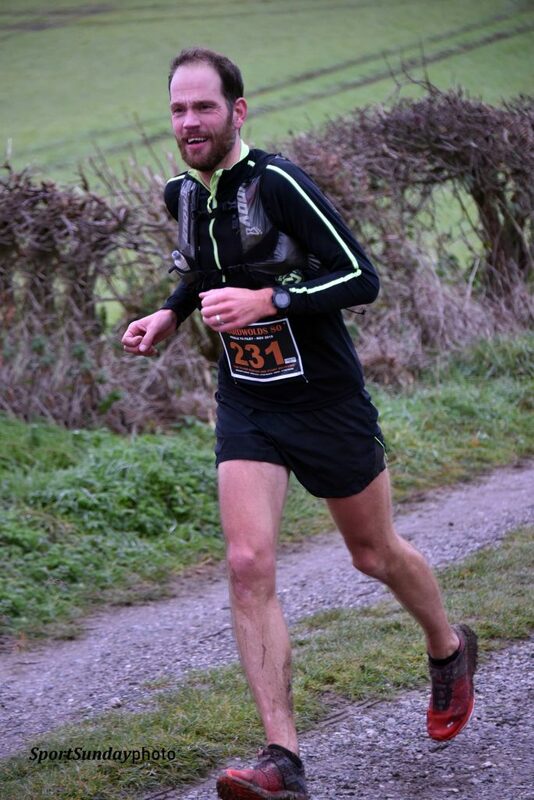 Jon Steele, race director of the Hardmoors Ultra race series (various distances, mainly involving running on the Cleveland way walking path https://www.hardmoors110.org.uk/) decided to organise a race to see if it could be done a bit quicker! 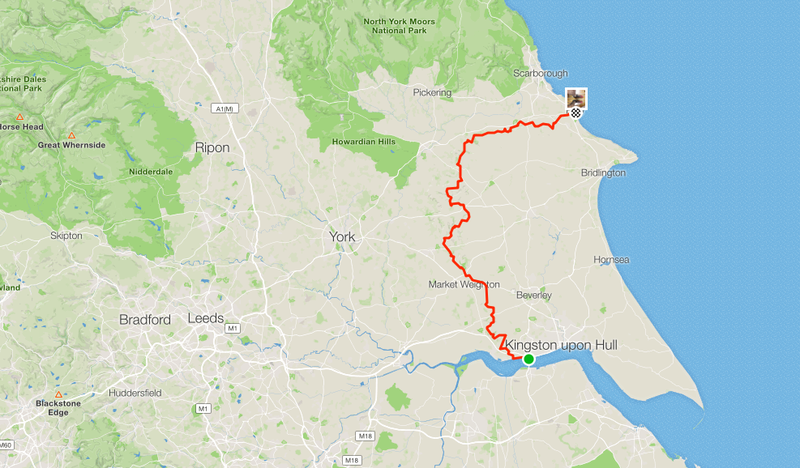 I stayed in Hessle the night before and picked up my start number and tracker at the start area underneath Humber Bridge. It was a bit cold, but the weather predictions looked fine, so I decided to start in a long sleeve, no jacket or leggings. The route would be marked with the standard national trail signs, so I had loaded the GPX file of the route onto my watch for route guidance. Or at least, that’s what I thought… Had a slight panic when I found out about 2 minutes before the 8am start time that the route was on Garmin Connect but not transferred to my watch yet. After franticly deleting routes on my watch while pressing transfer on GC on my phone I managed to transfer and load the route while the countdown to the start had started. Adrenaline at a high, off we go! In order to avoid getting caught in the back at the bottleneck of the first gate after 200 meters I started quite at the front and started off at pace that was not sensible for an 80 mile race, so literally off to a good start. Settled into a more reasonable pace along the Humber waterfront with two other runners. I was very happy to run with others as I wasn’t sure how well the route would be indicated and extra sets of eyes are always good. This was proven quickly after less than a mile when the route took a left fork without any signs, but one of the runners had done a recce and assured us it was the right route. We steadily made our way to checkpoint one, at which point I was only running with Rob Payne. Ultra-running pace is easy enough (at least at the beginning) to have a normal conversation so we talked about running and found out we both had plans to do UTMB in 2019. After we both zoomed through checkpoint 1 (1h20m) at 10 miles (I had enough fuel on me to make it to CP2 where I would meet John) we were making our way to CP2 when a runner behind us caught up with us. Now, this is where my run went from “let’s see how long I can stay with a group and see what happens” to “let’s try something now”. I decided to keep going steady towards CP2 and created a small gap behind me. 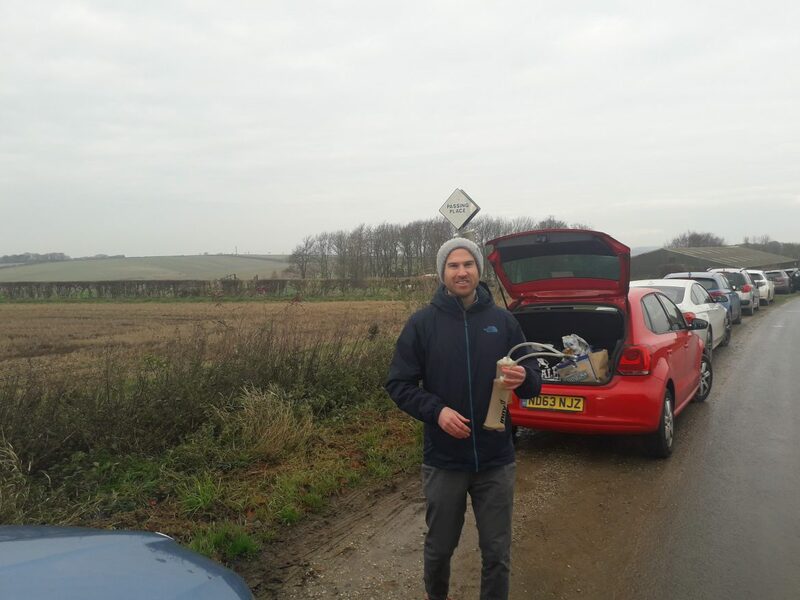 Arriving at CP2 (20 miles, 2h37m) I even had time to take a picture of John standing there with filled bottles. We exchanged hellos and gels and by the time I had restocked the other two runners passed by to the table with the food and water provided by the race. I quickly passed them while they were restocking and with about 20 trail miles in the legs tried to put out a few ~7min/miles to create some more distance. Those faster miles circled back to me quite quickly and I struggled to keep the pace up. As I was running by myself and getting tired I started to get a bit paranoid. Were those faster miles a mistake? Am I blowing up? Am I getting caught, should I look behind me? The usual “in the lead paranoia”. Every time I went through a gate (and there were loads!) I made sure to partly turn around to look behind me. CP3 at 33 miles (4h07m) was steadily getting closer. No crew was allowed at this CP in the Millington Village hall, I had taken enough fuel on board to make it to my next rendezvous with John so I was planning to go through quickly. I made sure to thank all the volunteers who were there and after 1.5 cup of coca cola and a spot kit check by the race director (he was EVERYWHERE on the course!) I was on my way again. Didn’t see any other runners coming into the Village Hall on my way out, so thought I had solid lead. Coming out of CP3 there was a steep hill. Luckily ultra-running distances provide an excellent excuses to walk steep up hills, so I decided that from now onwards hills would be walked. Again, I had no clue whether other were also doing this, walking just made sense at this stage. A long smooth runnable downhill ended in a small steep valley that needed to be crossed. During a quick glance backwards I thought I could see another runner, but I wasn’t sure. I kept on pushing and looking back, but no other runners were to be seen anymore. I entered the village of Friday Thorpe (39 miles, 5h39m), no CP, but crewing was allowed here. I spent some time talking to John, downed a red bull and sorted out headphones and a portable charger to recharge my watch. John reassured me that the next runner was at least half a mile back and I had nothing to worry about. Of course at that moment another runner showed up. I wasn’t too worried somehow and left John in a good mood (might have been the red bull kicking in) getting back into good running form quickly. 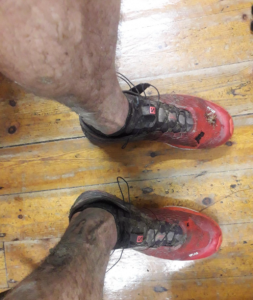 Now, at this stage I had been running for over 5 and a half hours, so the next bits of writing are not necessarily reflecting how things actually took place… I started playing some music, something I had never done before during a race. I made this playlist for the Lakeland 50 back in July, but didn’t use it then as it was too much hassle to get my phone out of my backpack. The music really helped to keep my focus on the running and keeping the pace reasonably high. The sun even showed it for a few moments on this stretch and the rolling landscape away from any signs of civilisation was great. The volunteers of the next CP had put out some lights and inflatable dinosaurs. Running up hill, passing a dinosaur while loudly singing along with “Zij gelooft in mij” (https://www.youtube.com/watch?v=VAc9opfAEYQ) towards CP4 (49 miles, 6h57m) was definitely a surreal highlight. Another quick exchange of gels and water bottles with John and I was on my way again. I honestly do not remember a much of the route between CP4 and CP5. I think it was still light during this section, I also seem to remember getting in and out of my rain jacket. I’m pretty sure I listened to “Wonderful days” by Charly Lownoise and Mental Theo (https://www.youtube.com/watch?v=LX-r3N6eh6k). CP5 (57 miles, 7h58m) was at Wintringham Village hall, but I met John outside on the parking lot so I never went in. From here to the next CP was a good 15 miles so I prepared myself for a few hours of being alone and running. Took out the headtorch as it was now getting dark. Jon Steele was there (again!) and warned me of an upcoming hill. That hill was missed initially as I took a wrong turn but once I found the sign it turned out the be the most iconic sign on the route and indicating a very steep hill. That hill was hiked up slowly and what followed was an eastwards running route along a north dipping slope. By now it was pitch black so could see the lights of towns in the valley in the north. This section seemed to last forever with a few left turns (downhill!) and right turns (uphill!) thrown in, but in general an endless eastwards plod. Coming out of this section there was a steep road section during which I decided it might be nice to look at some messages on my phone. Becki had been updating Instagram and Facebook during the race and I could see lots of people replying. I figured that while I was walking on the road I could see if I could reply. Of course I immediately missed a turn off… Next was a section that felt like you were running towards an alien space ship in the distance, but that just turned out to be a RAF station with lots of lights. This was then followed by what can only be described as cruel, three steep narrow valleys that had to be crossed. 3 times a steep technical section followed by a steep uphill is not fun after about 70 miles. At the end of (what turned out to be) the last long steep hill the lights of CP6 (72 miles, 10h36m) showed up. John had promised me a beer at this checkpoint, which sounded good for about a minute. A can of red bull felt more appropriate, we would share the beer at the finish. Left CP6 in good spirits, John told me the nearest runner was nowhere near me, so it was up to me to decide in what time I would like to finish. That motivated me to keep on pushing (as far as you can after 72 miles) and avoid walking as much as possible. Even smaller hills were now an excuse to slow the pace down to nearly walking. Based on the Strava trace I made two navigational errors in this section, I don’t remember those. Toward Filey the race route left the Wolds Way to ensure no runners would pass through residentially areas at night, there would be an out and back to the finish of the national trail and then back in Filey for the finish of the race. John found me at the edge of Filey to run the final few miles with me. At the time I could not understand how he found me and I kept saying how lucky he was. I kind of forgot about the GPS tracker that was attached to me. It was great to have company in this last section, my head was all over the place, so to be able to talk to someone else besides yourself was great. We got to the waterfront quickly and could see the end of the promenade in front of us. Now, as I had not done a recce, I assumed the end of the Wolds Way national trail would be located there, on a flat bit of asphalt. 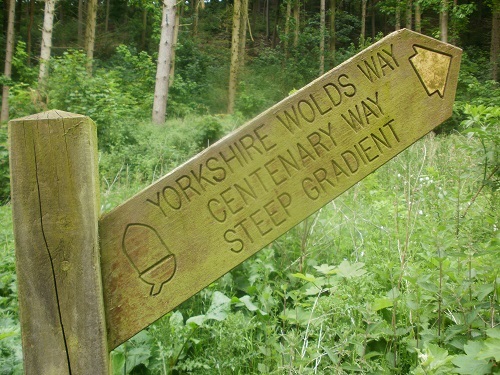 Unfortunately getting to the Wolds Way end point involved another set of steps uphill, then downhill and uphill again, only to be repeated on the way back to the finish of the race. I did not enjoy this section at all and was very happy to have John there to help with navigation and keeping some sort of pace. After too many steps we arrived back at the seafront and moved into Filey. It was then that I realised I would soon be stopping and I would be allowed to stop running. After more than 12 hours of it, I was done with running. After a little trot through the deserted streets of Filey the finish was located inside the building of the Filey Sea Cadets. My number was scanned, tracker removed and that was it. I could finally stop, sit down and take my backpack off. And my shoes. That did not look pretty. I ate some chilli and shared some beers with John while we watched more runners coming in. I mainly felt overwhelmingly tired but it was good to chat to lots of runners and their support crew, the world of ultra-running is full of wonderful people who have amazing stories to tell and a big hall in Filey, decorated with sea faring things and with a boat trailer in it, at the end of 80 miles of running is the best place to share stories. Having a support crew for an ultra-run really makes a difference, not only for a quick turn-around at checkpoints filling up on fluids and fuel, but mainly for the mental aspect. Really good to have someone there to keep you sane, thanks John for giving up your entire Saturday (and a good chunk of Sunday morning) to help me out, looking forward to running Comrades with you in 2022 (long runs require long terms plans!). Now it’s time to find lots of long steep hills around the North Pennines and Lake District to prepare for UTMB 2019! Amazing stuff Cees, made for a good day’s entertainment following your tracker trail. Looking forward to your UTMB report. Surely the only hill you ever need for training! Congratulations Cees on a terrific performance. And a big pat on the back to John for his massive contribution over the weekend. Great team-work. Great read, and an even more impressive run! Already looking forward to your future adventures! Sounds like John is a natural at crewing as well! Well done cees. Achieved what I’d dream of. What an insight into your race though. And refreshingly similar. Just got to build some stamina. Thanks Dan. Race paranoia is a real thing! Your mind just plays tricks with your head all the time. “The usual “in the lead paranoia”” is not very usual at all to most of us! Fantastic achievement and a great run report. Well done and good luck with your UTMB training.